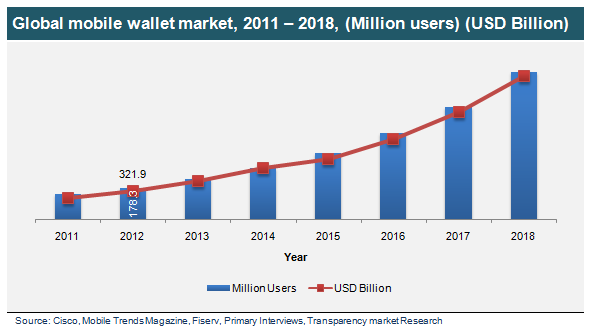 As per a recent market study published by Transparency Market Research (TMR), the global mobile wallet market will exhibit a whopping CAGR of 30.7% between 2012 and 2018. TMR, a market intelligence company based in the U.S., states that the global mobile wallet market will be worth US$1,602.4 billion by 2018. The research report, titled “Mobile Wallet Market - Global Industry Analysis, Size, Share, Growth and Forecast 2012 - 2018”, is available on the company website for sale.TMR market research finds that the mobile wallet market is expected to exhibit an upward trend in the foreseeable future owing to increased penetration of the global smartphone market. The increased presence of smartphones, cellular data usage, and information security are the primary factors driving the global mobile wallet market. Additionally, the rising adoption of mobility payment services is driving the global mobile wallet market. The market is witnessing great success due to the enhanced customer experience, a fulsome experience in terms of speed, security, and well-conceived user engagement, as reported in the study.In spite of the potential of mobile payment services to transform shopping and remittance experience, inadequate awareness regarding the function of mobile wallets, privacy, and security issues faced by users will challenge the market, as stated in the TMR study. Hence, customers are resistant to switch from credit card or cash to mobile wallet services for payments. Despite the inhibitors, government initiatives for the adoption of mobile wallet services will result in steady demand for the services. The increased production of smartphones enabled with NFC (Near Field Communication) and POS (Point-of-sale) terminals will further drive the mobile wallet market, as per the study findings. For the purpose of the study, TMR segments the mobile wallet market as per industry participants, components, applications, consumer types, and geography. As per the study, the value chain of the mobile wallet market includes mobile network operators (MNOs), payment networks, financial institutions, merchants, intermediaries, and consumers. MNOs are important elements in the mobile wallet value chain, active data and mobile network together being the basis of mobile wallet applications. On the application front, TMR segments the global mobile wallet market into retail, public transportation, vending machines, restaurants, and grocery stores. As per the study analysis, the retail sector was the largest application segment and was worth US$144.8 billion in 2011. Additionally, initiatives to install POS devices in retail outlets combined with smartphones facilitated easy payment from any location will further spur the growth of the mobile wallet market. As per the TMR research report, some of the major corporations in the global mobile wallet market are MasterCard, PayPal Inc., Visa Inc., American Express Inc., and Google ISIS.